Today I mowed the backyard which ended up in tomato face. I will spare you the photo but know that tomato is the only acceptable description. It was hot. And of course as I am almostttt done it cools off and gets breezy. Thanks Mother Nature. Tomato face is here. Anyhow I showered because I was gross, obvi and after decided to let my hair air dry with a little Moroccan oil to see how it looked. 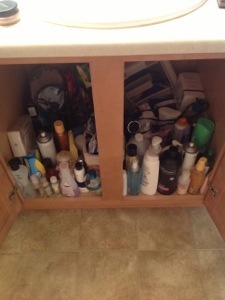 Brian has asked me to organize under my sink to which I always reply it is organized. False. This is under my sink. Needless to say, Brian is correct and I do need to organize under there. I failed to find any Moroccan oil. Point proven better half, point proven.